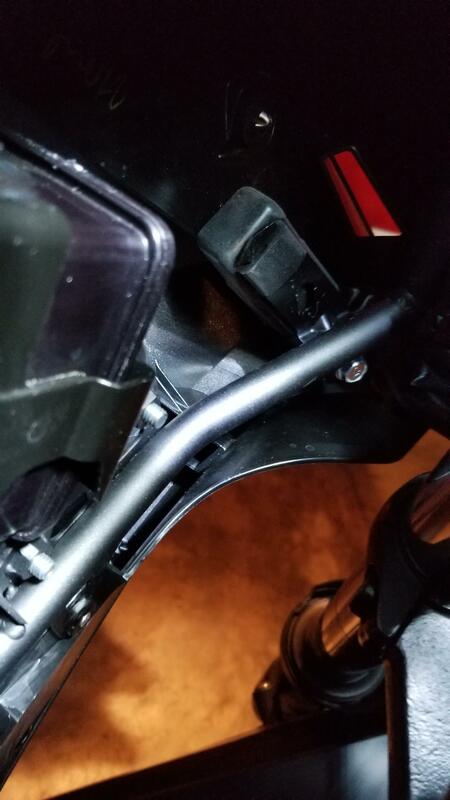 After finding a post about 650 Versys using bikemaster power outlets instead of Kawasaki DC outlets on one of these Versys forums, I decided to fit the $8 bikemaster outlet in the dash of my VX300 instead of the OEM unit. Had to extend the leads on the DC outlet to reach the bullet connectors under the dash but otherwise fit like OEM. Installed the outlet and the Kawasaki Accessory relay. onewizard, twowheels, katkwik and 2 others like this. I want to do the same to my X-300. Where is the switched power connector? Why is it necessary to install the Kawasaki power outlet relay? Surely this outlet will only be for phone/GPS/camera and a relay would be unnecessary? On all my other motorcycle I have just found a switched power source. Usually there is a spare there somewhere, my V-Strom has one under the tank for heated grips, and I used that. So If I can locate a switched power source on the X-300 there is no need for a relay? That's what I use and it works great although I think it cost more than $8, still much cheaper than the Kawasaki one, although similar quality. I've also purchased sockets for $1 from EBay but the bike-master is higher quality and I has the leads and a line fuse built in. I drilled my dash with a 3.5cm bit. They have collar that tightens up to hold it in the hole. The leads connect direct to the battery. It has a durable rubber cap to keep it covered when not in use. The socket has even filled with water when I left the bike parked overnight in a rainstorm with the cap off with no ill effect. Unsalted water (rain water) does not conduct electricity! A switched power source can be advantageous if you have something with a parasitic power draw or something you might accidentally leave on and drain the battery but with a power socket there is no need for it to be switched. It will only draw power if something is plugged in. Being unswitched means you can used it while the key is out of the ignition, like charging a phone/gps or running an air compressor to fill the tires. When you install the power socket, first check first that the placement will not interfere with the movement of the handlebars at full lock - sometimes USB adapters and the plugs that plug into them protrude a bit. Last edited by twowheels; 07-04-2017 at 12:52 AM. ...Installed the outlet and the Kawasaki Accessory relay. ...Where is the switched power connector? and it 'powers-up' the various wire-sets that Ma Kawi thoughtfully installed for us, altho' it ONLY allows 5 amps. Co$t me about $16 Canadian from my dealer. I want the socket live all the time. Installed one today made by Custom Accessories. Got it at O'reilly auto parts for about $12. Fit into the hole on the instrument panel snugly, and is held in with a threaded ring on the back. Also installed the factory relay kit (needed for the fog lights I installed at the same time). I'm not sure if the bullet connectors are powered without the relay kit? On the 650 (mine is the '15 650LT), they are NOT powered w/out the relay kit. Unsalted water (rain water) does not conduct electricity! Like Eddie said. FYI, unless the water is 0.00 micro Siemens ( rain isn't), it will conduct electricity, especially DC. My point is fresh water is a poor conductor of electricity but it's conductivity can be greatly increased by adding salt or sometimes other elements that will dissolve. For instance when I left the cap off my 12v outlet on the bike and parked it, a late night rain storm filled the live socket with water. It did not short anything or drain the battery even though the bike sat for over 12 hours with a live 12V socket full of water. On the other hand rain water will sometimes cause a high voltage line to arc over a cracked insulator where it will not do so in the dry. Voltage is the electrical equivalent of water or air pressure, current is the volume of flow (gal/hour). I had a summer job with the local electrical utility once, inspecting high voltage lines. It conducts slightly better than air but not anywhere like a true conductor. The movies where someone is murdered by throwing a toaster in the bathtub is based on false science. Last edited by twowheels; 10-02-2017 at 11:46 PM. My point is fresh water is a poor conductor of electricity but it's conductivity can be greatly increased by adding salt or sometimes other elements that will dissolve. For instance when I left the cap off my 12v outlet on the bike and parked it, a late night rain storm filled the live socket with water. It did not short anything or drain the battery even though the bike sat for over 12 hours with a live 12V socket full of water. On the other hand rain water will sometimes cause a high voltage line to arc over a cracked insulator where it will not do so in the dry. I had a summer job with the local electrical utility once, inspecting high voltage lines. It conducts slightly better than air but not anywhere like a true conductor. The movies where someone is murdered by throwing a toaster in the bathtub is based on false science. I spent over 30 years fixing inverters, and still consult, everything was water cooled. A fact of life using de-ion cartridges, ideal conductivity was 20 micro-siemens, which was roughly 1 million ohms with a 1/2 inch water line. The lower you go the more the water will try and re absorb from the copper coils, the tubing,above 40 micro siemens you get electrolysis. So having said that you would think, like yourself that there would be no issue with rain water getting into the 12 volt socket, so I too thought. This isn't a very good picture, but just to the right of the vacuum gauge is my distribution. I have a 12 volt outlet with a adapter plugged into it at all times for my GPS, this is under the plastic but I have been in some heavy rain / torrential downpours, last fall it would drop out and stop working. Thank you for this great post!! Nice of you to take the extra time for the photos!!!!! Bikemaster dual USB. Mount on your bars or in OEM slot. Direct wire with fuse or attach to battery Tender. 12V sockets becoming obsolete. Last edited by Brockie; 10-24-2017 at 11:48 PM. Thanks for this thread. It is so much easier when others have paved the way. :-) I will follow Brockie's lead by using a switched wire since this will be a low power outlet for a phone and action camera. A 5A circuit should be sufficient. I did a Battery Tender lead direct to the battery for a compressor if needed and for the winter to keep the battery maintained although I tend to ride most of the year here unless it becomes arctic. Last edited by SECoda; 10-22-2017 at 12:41 PM. Well I was up at the dealer yesterday and they gave me the $18 relay for free for posting a positive review on them. So now I have a relay and am about to install it. With the handlebar all of the way to right I have good access to the harness plug for the relay and the power outlet connectors (I have a bag of connectors). I can manipulate it with my fingers even. I just don't see the need to remove everything for this installation yet.... I guess my hands are small enough. I have avoided the disassembles before including removing the tank on my V-Strom on one wiring harness install. I also have a set of very long handled tools to help (but I can get my fingers on everything in this case). You also need a shorty Phillips (or better yet a long flex shaft Phillips) to get the 12v plug out. Wish me luck. Last edited by SECoda; 10-24-2017 at 10:56 AM. The relay took 5 minutes to install. Don't waste your time disassembling the bike for this. Removing the plastic plug is probably the toughest part (see later on that this was easy too). A flexible shaft Phillips head driver should do it (not needed). Last edited by SECoda; 10-24-2017 at 01:42 PM.